The greatest growth in Asia and Africa, respectively of + 1.5% and + 2.5%. America with its + 0.96% is below the world, while Europe is the only continent to have an almost zero trend (+ 0.1%). Vatican City (AsiaNews) – The number of Catholics is growing worldwide: 1.313 billion or 17.7% of the population. The data contained in the Annuarium Statisticum Ecclesiae 2017 is even more significant if we take into account that the growth rate of the world population is 1.1% while the rates of variation of Asia and Africa are respectively + 1.5% % and + 2.5%, America with its + 0.96% is below the world, while Europe is the only continent to have an almost zero trend (+ 0.1%). The reading of the data by continent highlights 2017, but those of the previous year are substantially similar, as the presence of Catholics is differentiated in the various geographical areas: from 63.8% of Catholics in the American population to 39.7% in Europe, 19.2% in Africa, up to 3.3% in Asia. 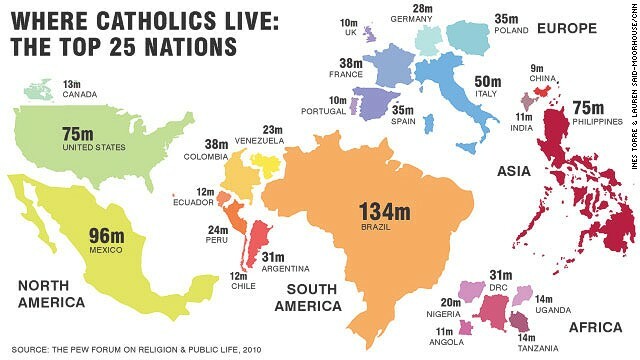 It is of some importance to underline how the American area is in itself very differentiated: if in North America the percentage of Catholics is only 24.7%, in that Continental Center and Antilles (84.6%) and in that of the South ( 86.6%) the presence of Catholics appears much more conspicuous. If these are the faithful, the apostolic forces have grown. At the end of 2017 there were 4,666,073, with an increase of 0.5% compared to 2016. The breakdown between the different components is quite different from continent to continent. In the world average, at the end of 2017 the percentage ratio between the total number of clerics and the total of pastoral workers was 10.4%, with lower numbers in Africa (6.4%) and America (8.4%) and higher ones in Europe (19.3%) and Oceania (18.2%). In Asia the percentage follows the global average. A comparison with the numerical situation of 2016 is striking, because it is the first time since 2010 that there has been a decrease of priests, passing from 414.969 in 2016 to 414.582 in 2017. Instead, there is an increase in the number of bishops, permanent deacons, lay missionaries and catechists. Candidates to the priesthood worldwide pass from 116.160 in 2016 to 115.328 in 2017, with a drop of 0.7%. The picture of continental flows appears satisfactory in the African and Asian Church, while in Europe and America the decrease appears very evident. The distribution of major seminarians by continent remains substantially stable over the last two years. With reference to the year 2017 it is observed that Europe contributes 14.9% to the world total, America for 27.3%, Asia for 29.8% and Africa for 27.1%.